According to this surprising book, high-seas pirates were bands of volunteers who democratically elected their captains, and minimized harm to their victims in order to maximize their profits. Pirates hired many blacks as freeman during slave times, and built up one of the best branding campaigns ever. Just seeing the Jolly Roger’s skull and bones approaching would prompt surrender — the whole point of the flag logo. Pirates were outlaws, and no saints, but they were not crazy marauders, but more like shrewd businessmen. Economist Peter Leeson shows how most of the legendary customs and behaviors of sea pirates can be explained by the dynamics of free market economics. They were governed by the invisible hand, or rather, the invisible hook. This refreshing perspective resolved a lot of mysteries for me about this famous subculture (why they didn’t rob each other, or mutiny more often, or die more often). At the same time, the book’s Freakonomics approach (“follow the money”) is a reminder that viewing cultural phenomenon in terms of economics can be extremely productive. And although this book dismissing the type of sea piracy going on today in Somalia and Indonesia as something different, I think we have not seen the end of banded piracy in the world. To disguise their ship’s speed, pirates sometimes tied barrels together, which they fixed to and threw over the ship’s stern. The vessel would then drag the barrels behind it, which significantly reduced its pace. This enabled pirate ships to slowly approach targets without suspicion. Once within reach pirates would cut the barrels, producing a turbo boost that shot the ship forward, surprising the target, which by this time was unable to escape. To prevent captain self-dealing, pirates democratically elected their leaders and dispersed power among other members of the crew, such as the quartermaster. Under this managerial setup a captain best served his own interest by serving his crew’s interest. If he didn’t, his crew could remove him from command. To prevent crew members from shirking, pirate organization made all crew members equal, or nearly equal, “shareholders” in the company’s profits. This strengthened the connection between each individual pirate’s effort and his individual payoff. To prevent piratical free riding, pirate articles established bonuses for crew members who displayed noteworthy courage and spotted prizes; and in some cases crew members reserved the right to vote on the share a particular pirate received. This allowed pirates to reward hard-working crew members and punish lazy ones. Pirate articles also provided workman’s compensation, which reduced private disincentives to take risks that could cause injury. Very few have achieved the instant brand-name recognition pirates achieved without fancy specialists. Pirates’ skull-and-bones symbolism against a black background may be even more widely recognized than the golden arches. If imitation truly is the greatest form of flattery, pirates should be blushing in their watery graves. The incredible range of pirate-inspired products available today–from Captain Morgan Rum, to Pirates of the Caribbean movies, to Ralph Lauren’s Rugby line of apparel–is a contemporary testament to seventeenth- and eighteenth-century pirates’ effectiveness in brand naming themselves. Pirates, for example, are a veritable ball of contradictions. They’re sadistic pacifists; womanizing homosexuals; treasure-lusting socialists; and madmen who outwitted the authorities. They’re stealthy outlaws who loudly announced their presence with flags of skulls and bones. They’re libertarians who conscripted nearly all their members, democrats with dictatorial captains, and lawless anarchists who lived by a strict code of rules. They’re torturous terrorists who command honest men’s adoration. Economics and, I’d argue, only economics, can disentangle this mess of piratical paradoxes. Contrary to popular perception, most pirates were volunteers, not conscripts. Pirates sought willing companions instead of forced men because of simple cost-benefit considerations, not because of a principled objection to using force to get what they wanted. On the one hand, in many cases pirates simply didn’t have to resort to coercion to increase their numbers. The better treatment and opportunity for vastly superior pay on pirate ships was plenty incentive for many sailors to sign on under the black flag when given the opportunity. The benefit of conscripting ordinary sailors was therefore quite low. On the other hand, the costs of pressing sailors could be very large. Forced men threatened to destroy the harmony pirates’ system of private governance was based on. Conscripts were liabilities to pirates in other ways as well. They could escape, informing authorities, or leaving the remaining crew too small to take advantage of the ship. Even if conscripts didn’t manage to escape, a crew with a sizeable portion of forced men was less likely to succeed since conscripts didn’t have the same incentive to participate as volunteers. Centuries before the civil rights movement, the ACLU, or the Equal Opportunity Act, some pirates had already adopted a policy of “hiring” black sailors in their crews. What’s more, these pirates extended suffrage to their black members and subscribed to the practice of “equal pay for equal work,” or rather, “equal pay for equal prey.” This is startling considering the views and policies towards blacks in the rest of the seventeenth- and eighteenth-century world. The percentage of black crew members in Kinkor’s sample ranges from 13 to 98 percent. None of these pirate companies were all white. In seven of the twenty-three crews, or nearly a third, half or more of the pirate crew was of African descent. If this sample is representative, an astonishing 25 to 30 percent of the average pirate crew operating in the height of piracy’s golden age was black. Pirates’ relationship to black sailors was peculiar. On the one hand, pirates’ attitudes toward blacks don’t appear to be different from their lawful contemporaries’ attitudes toward them. Pirates took slaves, held slaves, and sold slaves. On the other hand, some pirates displayed significantly more tolerant behavior toward blacks. Upward of a quarter of the average pirate crew may have been black. Many of these sailors were former slaves and at least some of them were treated on equal terms with white sailors in the pirate crews they sailed with. They had equal voting rights in the pirates’ democracy and likely received an equal share of the pirates’ plunder. This is especially remarkable since, on the surface, pirates had nothing holding them back from enslaving black sailors they captured–bondsmen or free. The simple logic of the “dispersed benefits and concentrated costs” of slavery on pirate ships may explain pirate tolerance. Since the benefits of enslaving a black sailor on a pirate ship were divided among its many free crew members and a substantial part of the potential cost of enslavement, namely the increased odds of a pirate crew’s capture, was borne fully by each free crew member, pirate slavery was sometimes unprofitable. This wasn’t always true. But sometimes the invisible hook led pirates to display a racial progressivism in practice that didn’t accord with the racial views in their minds. The seventeenth-century buccaneers, which this book has referred to at various points, established an interesting institution called matelotage, which some have suggested had homosexual overtones. Under this institution one buccaneer would pair up with another, mutually agreeing to share belongings and creating a contract according to which, in the event either man died in battle, for instance, his share of booty would pass to his matelot. If there’s something implicitly homosexual about such arrangements, I must confess, it’s certainly escaped me. As Exquemelin described it, matelotage agreements sometimes explicitly made provisions for bequeathing property to a dead buccaneer’s wife. Like other pirate practices, this one also has a simple economic explanation: risk sharing. Matelotage was as a form of insurance. Buccaneers could diversify the risk of their chosen trade by spreading their potential gains and losses over two people instead of one. Whether they sodomized one another is beside the point. Matelotage created insurance for buccaneers and helped them bear the uncertainties of maritime marauding. Pirates may have been “bad” men, motivated by ignoble desires, and even willing to use violent means to satisfy these desires. But the outcomes of their profit-motivated behavior were sometimes laudable. For example, profit seeking is what led pirates to avoid blasting their prizes to pieces. It also prevented them from wantonly brutalizing their captives. And it limited their reliance on conscripts. Of course, in each of these cases, piratical greed didn’t lead to genuine public “benefits.” Pirates’ victims would have always been better off if they hadn’t faced the threat pirates posed in the first place. But conditional on pirates’ presence, pirates’ ignoble motives–self-interested greed–softened the harms pirate victims suffered. Pirates didn’t embrace “enlightened” values as ends in and of themselves. They embraced money. But their tireless pursuit of the latter gave way to the desirable outcomes associated with the former and did so before their legitimate contemporaries achieved anything like the same. Modern pirates share little in common with their predecessors. 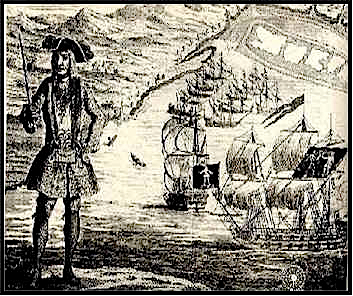 Seventeenth-and eighteenth-century pirates lived together for protracted periods of time at sea. Although they retired to land between expeditions, they spent much of their time together prowling the ocean in search of prey. Because of this, their ships formed miniature “floating societies” that, like all societies, required social rules and governance institutions to function. In contrast, most modern pirates spend very little time together on their ships. There are three main modes of modern piracy. The first and most common mode is little more than maritime muggery. Pirate “crews” of two to six hop in small boats; pull alongside ships, usually in territorial waters close to the coast; and threaten their prey at gunpoint to give up their watches, jewelry, and whatever money they may be carrying. These sea bandits are part timers.